The tour starts with a 5-10 minute orientation session in front of our office on a big open square where we will help you learn all the basics of using a segway (It’s not included in the quoted time). Regardless of the time of day, we will give you a perfect overview of the centre of Pest and the bank of the Danube. Starting from our office, we will roll through the whole city centre seeing sights such as the Vörösmarty Square, the Danube Promenade, the fabulous Chain Bridge and the House of Parliament stretching close to it. We will also take a look at the Liberty Square and the city’s largest cathedral, the St Stephen’s Basilica. 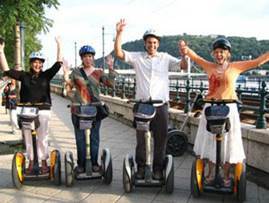 With the 1 hour long Budapest Segway Grand tour you will also have a chance to see the Grand Synagogue, the National Museum, the Central Market Hall, the Andrássy Avenue, the Hungarian State Opera House, the House of Terror and much, much more! Our segway tours usually do not have more than 6 participants, making them an interactive and personal adventure designed for your tastes. You will have plenty of opportunities to ask questions, and get to know your guide better. Inclusions: guided training and tour, Segway machine rental, Stops for photos. Children Policy: No children under 10 years of age or 40 kg. Parents must sign liability and wavier forms for younger participants under the age of 18 years. Terms and information: Tour goes in all weather conditions – refunds/exchanges are not given due to adverse weather. Please dress for weather and we encourage our guests to bring hats and gloves to keep the extremities warm during colder months of the season. Not responsible for unforeseen delays or accidents. Must sign wavier forms for tour participation. This tour can be bought directly before it goes. Confirmation for this product will be received at time of buying. Insurance requires everyone to complete a liability waiver (children under 18 years must have an adult sign for them).